The worst thing about going abroad during baseball season is missing baseball. So when I had to go to Sweden on business, I had resigned myself to a break from baseball. The weather in Stockholm was crap anyway. But I did a little search for the hell of it and found that there’s an active Baseball and Softball Association, and that there was a “match” scheduled for Saturday in the top division, the Elitserien. Well, the rain was coming down pretty good Saturday morning, so I figured it would be rained out for sure. Then I checked the web site, and the game was on, as evidenced by live scoring. So I ran to the subway and took the number 17 to Skarpnäck, a suburb south of town. There’s a big public sport park (idrottsplats) with football fields, tennis courts, a baseball field, and a softball field. I got there during the fourth inning with Stockholm leading 1-0. They were playing Sölvesborg from Blekinge in the south of Sweden. The rain had recently stopped, and the field was in quite good shape. It was a nicely manicured field with an outfield fence (didn’t notice any distances) and a chain-link backstop. They even had lights, but the guy said they weren’t very powerful. The dugouts were rather improvised, but there was a nice set of bleachers behind home plate, as well as a little press box where the guys were scoing the game on the internet. I asked them for a roster, but they didn’t have any spare copies. They had a speaker set up in the bleachers, which they used to announce the batters and even play walk-up music for the home team. (Unlike in Binghamton, the volume was tolerable.) Of course, they played TMOTTBG during the seventh-inning stretch. Not surprisingly, no one was singing. It is Sweden, after all. There were about a dozen folks in the stands for the whole game, and a few others wandered by to watch from time to time. I talked to one guy who was wearing a Stockholm team jacket and cap. He told me about the Stockholm club, which has quite a few teams: seniors, juniors, cadets, and a few more kids’ teams. Saturday was a double header for the senior team, and they had some of the kids’ games scheduled for Sunday. All the Stockholm players are native Swedes, but the manager is an American guy named Trevor Rooper. (Nope, he’s not in baseball-reference!) Most of the guys looked like they were in their teens and 20s, but there were a few older guys too. There was a girls softball game going on next to the baseball field, but their game was over by the time I wandered over for a closer look. I talked to a group of folks watching their first game. They live in the area and walk by the sports fields all the time, but this was their first time checking it out up close. I had to explain a sac fly and an intentional walk. They asked me to let them know when they should root on their team! The level of play was probably a bit below high-school level. There was not much solid contact. Saw lots of weak ground balls and strikeouts. The pitching was much better, however, at least in terms of control. I think I saw only two walks. It looked like mostly BP-type fastballs, but I did see Stockholm’s pitcher throw a couple of off-speed pitches. Fielding was hit-and-miss. I really noticed it during the throws. Not much zip at all. I think even I could have stolen second off the catchers! The equipment looked top-notch. No names on the back, but a few of the Stockholm guys had a URL (www.frozenrope.se), which was a baseball supply store that looks to have gone under since. I was surprised that they used wooden bats. Not many balls were fouled out of play (lack of contact), and they did not spark frenzied scrambles as in the States. One of the kids would just retrieve it and give it back. Two umps worked the game. Everything I heard them call was in English. The final was 2-0 Stockholm, which was an unusually low-scoring game. [BOX SCORE] I had to leave after the first game, but Stockholm took the second game 20-5. Mercy rule. Stockholm is the best team in the country. They’ve won something like four of the last five national club championships. So, who knows, maybe baseball in Sweden is where golf was 30 years ago. They’ve got a long way to go before they can think about the World Baseball Classic, but you never know. A few guys have mentioned that there are a lot more R symbols out there this season. Commish & I were talking about it and speculated about how the symbols are calculated. I guessed that the R & H symbols depend solely on how many home runs a pitcher gave up with runners on base relative to the total number of homers he surrendered. I collected some stats from Baseball Reference to see how they compared to the symbols. I initially selected the 43 starters currently on the ABL active rosters. I later added some H-symbol starters from Taxi Teams and the free-agent pool, because the H symbols were underrepresented. I didn’t look at any relievers, but I don’t expect they would have rules different from the starters. 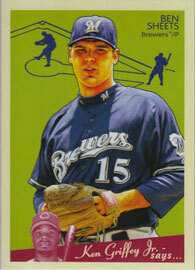 I looked at the 2013 MLB stats and the TPB cards we’re using for the 2014 ABL season. In B-R you can find the relevant stats under the “Splits” menu in the “Standard Pitching” section on the particular pitcher’s page. Scroll down to the “Bases Occupied” table. Strasburg’s stats are shown below: 7 homers with the bases empty, 9 with runners on. When the overall home-run rate is greater than 2%, the symbols act like I expected them to. If the percentage of home runs with runners on is large, the guy gets an H. If that percentage is small, he gets an R. But it’s a different story when the overall home-run rate is less than 2%. In that case, it doesn’t matter what the stats are for on-base and bases empty; the guy gets an R, period. The clearest example is Henderson Alvarez, who had guys on base every time a home run was hit against him. But that was only two homers in 418 plate appearances, a very low rate of 0.48%. That low rate earned him an R, despite the fact that he gave up zero solo shots. So it’s obvious that the R symbol is used to reduce the number of homers from the batter’s card when the pitcher gives up fewer than average home runs in general. With power becoming scarcer recently, it’s not surprising that more Rs are required. On the other hand, although there were 273 fewer home runs in 2013 compared to 2012 (as Commish pointed out), there were even fewer in 2011. I wondered why the overall homer rate couldn’t instead be handled via the Deep ranges. I think the answer is that if you lose the Deeps, then you lose the park variation that forms such an important part of the game. If a guy has no Deep ranges (and there are some, of course), then it doesn’t matter what park he’s pitching in or what Power the batter has (except for the Deeps from Park Effects, of course). 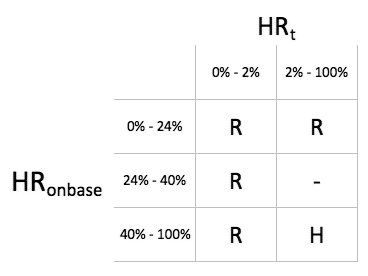 So, my conclusion is that the R & H symbols are based more on the overall home-run rate of the pitcher, and not so much on the state of the bases when the home runs were hit. Phillips & Freese weren’t really draft picks, but were picked up shortly afterwards. 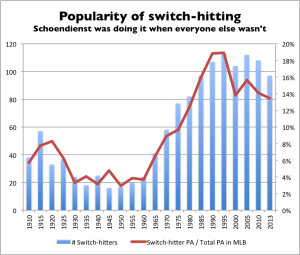 Here’s a fascinating graph showing the prevalence of switch-hitting over the last century. 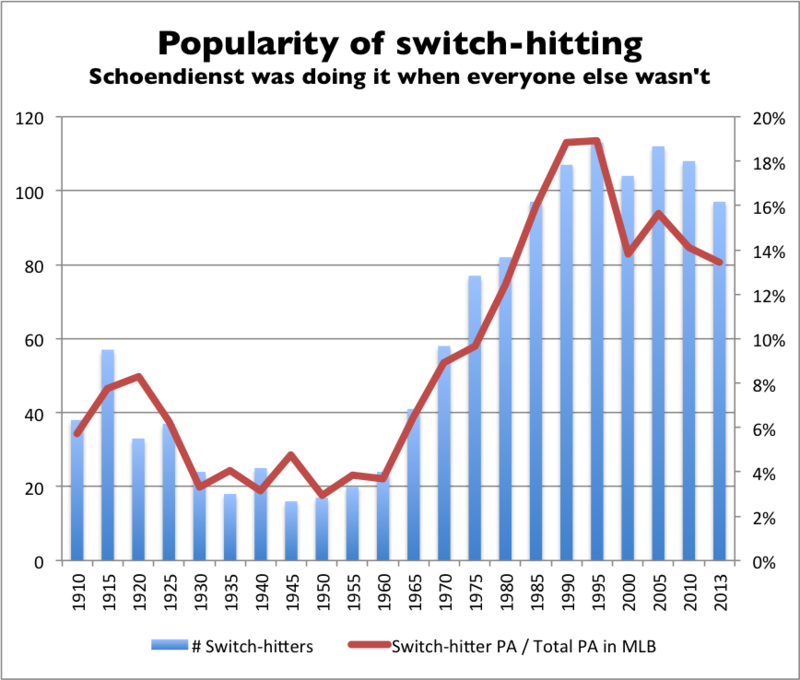 It’s from an excellent post about Red Schoendienst on the Fungoes blog. There are two changes to the 2013 Deep chart that will be used for the 2014 ABL season. San Diego’s park has become significantly smaller. Seattle, where the Hazard play, shrunk a little bit in LCF & CF. The first World Series night game was Game Four of the 1971 series at Three Rivers Stadium, a 4-3 victory for the Pirates over the Orioles. 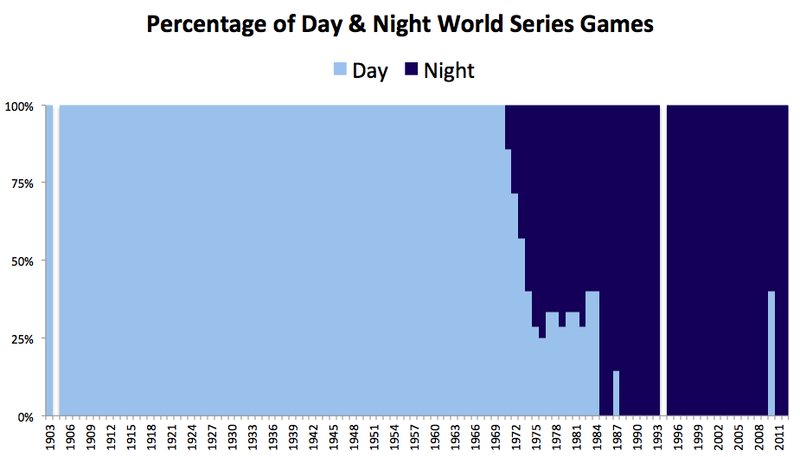 I checked Retrosheet to learn how quickly things transitioned to an all-night-game series. I went by the “day/night” flag in the info section. By 1974 more than half the games were being played at night. For the next decade, about a third of the games were still played during the day. The 1985 series between the Cardinals and Twins was the first series without a day game. 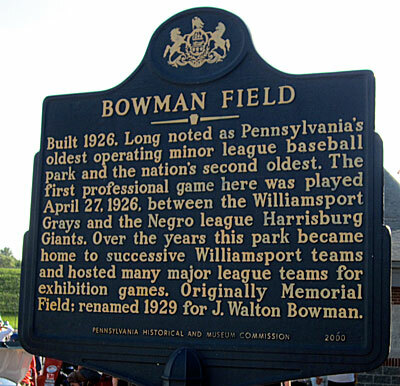 A day game was played in 1987 at 4pm local time on a Saturday afternoon in Minnesota. Of course, since it was played under the dome, there was no direct sunlight. The graph shows day games played in 2010. That happened because the Giants were hosting games in the Pacific Time Zone. In order to hit the magic 8pm Eastern Time spot, those games started at 4:57pm and 4:59pm local time, according to Baseball Reference. Retrosheet’s day/night discriminator is apparently 5pm, so those games count as day games. The local sunset was around 6:18pm, which means about an hour and 20 minutes in the daytime. Those start times still look a little strange to me. I thought the 8pm start times dictated first pitches at about seven minutes past the hour. That’s what happened in 2012 when the starts were 5:08 & 5:09 Pacific Time, again in San Francisco. However you classify these “twilight” games, it’s safe to say that we won’t see a real World Series day game for a long time, if ever. Too bad. Saw a note about new Retrosheet modifiers on the Chadwick mailing list. Unfortunately, these are not documented on the Retrosheet site, and it makes me wonder what else is missing. This spam comment made me LOL. of course like your website however you need to check the spelling on several of your posts. A number of them are rife with spelling problems and I find it very bothersome to tell the truth however I will surely come back again. Skibby tweeted about looking for baseball nicknames, so I ran a count of the nicknames at Baseball-Reference.com. 286 Leftys! Baseball Reference has a free trial for their Play Index, so I’m giving it a whirl. Who are the worst hitting pitchers of all time? I’ve got no magic criteria, but it’s easy find some guys who were epic fails at the plate. 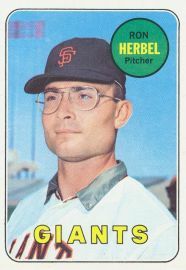 Rob Herbel pitched in 332 games in the 60s and early 70s, mostly for the Giants. He managed only six hits in 227 plate appearances for an anemic .029 batting average. He struck out 125 times (55% of PAs) and walked only eight times. Actually, one third of his hits were doubles, which raised his OPS to .104. I bet a few of those doubles were hit to sleeping outfielders. Dean Chance won the AL Cy Young in 1964 and accumulated 759 plate appearances in 406 games. He recorded 44 hits (.066 BA), all but two of which were singles. He struck out 420 times (55%) and walked only 30 times. With 128 wins and a 2.92 career ERA, he’s probably the best pitcher ever who was useless with a bat in his hands. 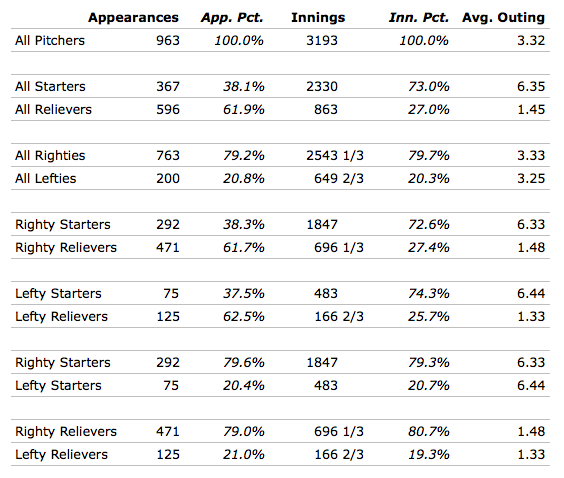 Of the active guys, Tommy Hanson & Ben Sheets are notable. Hanson is 11 for 187 (.059) with 92 strikeouts, 5 walks, and zero extra-base hits. Sheets is 34 for 449 (.076) with 212 Ks and 19 walks. 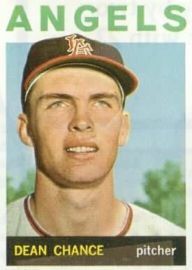 Although Randy Tate was in the bigs for only one year, he holds the distinction of having the most career plate appearances (47) without a hit. He did manage to draw one walk, though! In six minor league seasons he hit .113, so I guess ’75 was just a down year for him. Tate had an unusually symmetric career: three years in the minors, followed by one full season with the Mets (He pitched in every month of the ’75 season. ), followed by three more years in the minors. 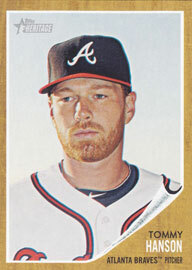 He was never called up during his minor league seasons, and wasn’t sent down during his only major league season! And, finally, of the pitchers with the dubious distinction of never having reached base safely ever, the guy with the most plate appearances (33) is none other than Justin Verlander. I think I’ve heard that he’s a decent pitcher, though. Verlander did not reach base during his three post-season PAs, and he never went to the plate during his 20-game minor league career. 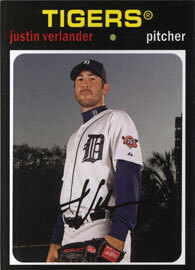 Let’s hope that the increase in interleague play will give Justin the chance to get off the schneid in 2013. 2013-09-30 UPDATE Verlander got only two plate appearances during the 2013 regular season, and they both came in the 162nd game. He went hitless, but so did the rest of the Tigers, as this was Henderson Alvarez’ no-hitter! 2014-06-18 UPDATE On April 12, 2014 in San Diego, California, in the top of the second with two outs, Justin Verlander reached base safely for the first time in his professional career when he grounded a single up the middle against Ian Kennedy. When he next came to the plate in the fourth… he hit another single!!! He would later score his first run. As of today Verlander has a .069 batting average. He is still looking for that first walk. Righties pitch 80% of innings. Righties start 80% of games. Starters pitch 73% of innings. The average start lasts 6.35 innings. The average relief appearance lasts 1.45 innings. The biggest difference seems to be that the average relief outing is longer for righties, 1.48 innings vs. 1.33 for lefties. That’s the LOOGY factor, but I thought the difference would be even greater. The totals are shown below, grouped into a few different comparison pairs. I saw some cool charts over at Fungoes made with infogr.am, so thought I’d try it out. Here are the division races during last year’s regular season. It’s the same data that produced the charts in the yearbook. Wouldn’t it be nice if Ellsbury & Hosmer bounced back? McCutchen to Syracuse, got Cespedes & Rosario. Alex Avila to Abilene, got Jed Lowrie. Betancourt to Tally, got Scott Atchison. 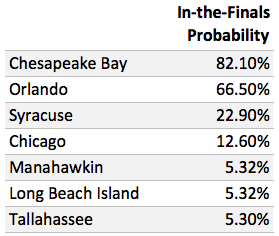 I was curious about the chances playoff teams have of getting to the Bambino Cup Finals and their chances of being crowned ABL champions. The playoff structure itself has a big impact, for example, the division champions have shorter roads to the cup. Of course, the relative strength of each team is very important, but how can that be measured? First, let’s consider the playoff structure in isolation. 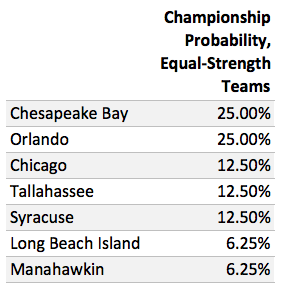 Assume that all playoff teams have equal strength. If that’s the case, then the chance of winning a game or a series is 50%, a coin flip. A division champ (C-Bay or Orlando) has to win two series, so they have to flip a coin twice and have it come up heads both times. That’s one chance in four, 25%. 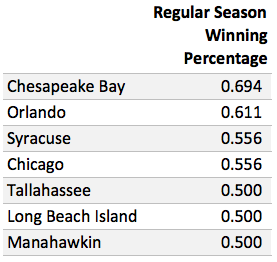 A team with a one-game showdown to get into the lower bracket (LBI or Manahawkin) has win four series. The chance of having heads come up four times in a row is only one in 16, 6.25%. 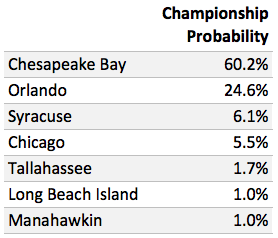 The probabilities of the 2012 playoff teams winning the ABL Championship under these conditions are shown in the table below. Now let’s look at team strength: how to measure it, and how to use it to determine the probability of winning a game and a series. Bill James applied some statistics to the question of how to measure the probability of one team beating another in one game. He called it log5, and it uses winning percentage to measure team strength. I’ll use the ABL regular-season winning percentages for this exercise. Quite a spread, isn’t it? One more series of calculations (and three more sheets of paper) gives the ultimate probabilities of teams getting their name on the hardware in 2012. An unscientific survey of Cardinals player apparel observed at the Cardinals game on Thursday August 9th. Most were name & number on a shirt/jersey. On August 2 the Dayton Dragons fell to the Lansing Lugnuts 5-2. They’re working on consecutive sell-out #860 or something, but there were lots of empty seats.